Gently and thoroughly remove makeup without irritating your skin with Oxygen Botanicals Makeup Remover. Safe even on sensitive skin, this makeup remover nourishes the skin while removing makeup residue to reveal a clean, clear complexion. Oxygen Botanicals Makeup Remover gently removes makeup from the surface of the face while infusing the skin with protective antioxidants and nourishing moisture. As it glides smoothly across the skin, you’re face will feel soothed and refreshed. Oxygen Botanicals Makeup Remover is gentle enough even for the most sensitive skin types, including eczema and dermatitis. The non-greasy mixture thoroughly removes makeup from the face and eyes while soothing and calming the skin with azulene and protecting the skin with antioxidants present in green tea extract. Use as a pre-cleanse before an Oxygen Botanicals cleanser! Oxygen Botanicals Makeup Remover will bring out the best in your complexion as it clears away your makeup. Oxygen Botanicals Makeup Remover is recommended for anyone who wears makeup. Do to its soothing characteristics and non-irritating formula, Oxygen Botanicals Makeup Remover works well with eczema, dermatitis, and other sensitive skin conditions. Massage a dime-sized amount of Oxygen Botanicals Makeup Remover onto the dry skin of the face using your fingertips in gentle, circular motions. Rinse thoroughly with clear water, then wash clean with an Oxygen Botanicals cleanser. It also may be applied with a cotton pad or swab. 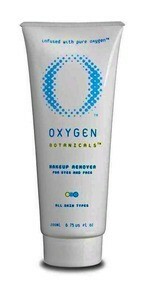 * Oxygen Botanicals Makeup Remover removes all makeup except waterproof mascara and extended-wear lipstick. Oxygen Botanicals Makeup Remover uses the following key ingredients: Japanese green tea extract, vitamin E, omega-3, omega-6, linolenic acid, and azulene.